Great memories will be made at the colorful 6 bedroom. 5.5 bath Atlantic Oasis. Thoughtfully outfitted with your vacation in mind, this bright, cheery, and artfully decorated ocean side home sits on one of the highest lots in the charming community of Sea Pines in Duck, with views over the ocean. Sea Pines offers a community pool, tennis courts and beach parking, and the house is a short walk or drive away from the Scarborough Faire shopping center and the great free summer offerings in the Village of Duck – which includes kids’ activities, bands, yoga in the park, a beautiful sound side park, a boardwalk path on the sound and more. Looking for great summer outdoor living? Then load the music and jam with the outdoor speakers on the deck, porch and Tiki bar. After a fun-filled day on the beach, you can relax outside on a hammock, clean off in two Costa Rica-inspired tin roof hot showers, or recover inside with high definition LED flat screen televisions, Netflix and Blu-Ray players. At night, invite everyone outside for a grilled BBQ and drinks in the screened porch, light up the Tiki bar, take a midnight swim in the LED colored pool lights, or hang out on the newly lit decks reading or playing games. Guests will enjoy a world of entertainment in the ground level recreation room, which features a pool table, sports bar with 3 TVs, kitchenette with microwave and sink, and a full refrigerator with ice maker, ensuring that every comfort has been supplied. There’s also a media room with a 55" widescreen TV, home theater and Queen Sleeper Sofa nearby for family movie nights, as well as a King Master bedroom with flat screen TV, and a master bedroom with 2 Queens and a flat screen TV. With so many ways to unwind and have fun, guests will be hard-pressed to leave this oasis within an oasis. At the end of a busy evening by the pool, head to the mid-level to relax in style in one of four tastefully appointed bedrooms. There’s a large King master with couch, Jacuzzi and comfort height toilet, a large King master bedroom with couch and private bath, a bedroom with Pyramid Bunk with Trundle, an additional King bedroom, a full bathroom, and a large shaded deck with hammock, swing, and cozy sitting areas and laundry area. When combined, this level serves as the perfect haven for gearing up for the next day’s adventures. The top level is home to the large great room which boasts beautiful cathedral wood ceilings, a comfy living room, and an inviting sunroom/office with comfortable Sofa and wet bar with 25 lb. a day ice maker. Gourmet chefs will adore the fully stocked kitchen with a new dishwasher and beverage cooler, and the 16 person dining table and 4 bar stools at the island ensures everyone can join in the feast. 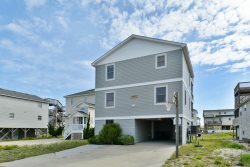 A half bathroom is found nearby, as well as the spacious screened porch with picnic tables, the large deck with ample seating and great ocean views, and a 6 person hot tub with speakers. Your Oasis is Waiting at the Outer Banks. From the top level bubbly hot tub to the ground floor Tiki bar, every aspect of the beach life is celebrated at this fully accommodating home. Discover how idyllic the Outer Banks can be with a stay at your own personal Atlantic Oasis. Top-Level: large great room with beautiful cathedral wood ceilings, fully stocked kitchen ready for gourmands with new dishwasher, beverage cooler, 16 person dining table and 4 bar stools at the island, comfy living room, an inviting sunroom/office , wet bar with 25 lb a day ice maker, half bathroom, screened porch with picnic tables, large deck with ample seating and great ocean views, and 6 person hot tub with speakers. Mid-Level: Large King master with couch, Jacuzzi and comfort height toilet, large King master bedroom with couch and private bath, bedroom with Pyramid Bunk with Trundle, additional King bedroom, shared full bathroom, large shaded deck with hammock, swing, and cozy sitting areas and laundry area. Ground-Level: King master bedroom with Flat screen TV, master bedroom with 2 Queens and a flat screen TV, recreation room with pool table, sports bar with 3 TVs, kitchenette with microwave and sink, full refrigerator with ice maker, media room with a 55" widescreen TV, home theater and Queen Sleeper Sofa, bath adjacent to pool, tiki bar with speakers, sun deck, and 2 outdoor showers.